As I’m sure most of you have already seen and read, David Gilmour announced earlier this week that he will be selling or auctioning off over 120 guitars from his collection. The auction is expected to raise a lot of money for different charities supported by Gilmour. Now, this came as a huge surprise to me and I’m sure to many of you. I’ve received lots of comments, messages and e-mails from you guys with links, questions and you’ve shared your opinion on the matter. This is surely something that has gained a lot of attention and emotions. From me too. The first thing that I though was – is he retiring? My second thought was – is he sick? My questions was answered shortly after by David in several statements and interviews. He is NOT planning on retiring yet and he is NOT sick. He wants to sell these instruments now when there is an interest and when he can see that the funds goes into charities that he feels are important. It might be hard to understand. These guitars and certainly a handful of them has been vital in creating some of the most iconic guitar sounds of all time. As he explain in one of the statements, these guitars has inspired him to write and create specific things that has become so meaningful to so many. For us, as fans and guitarists, it’s hard to understand why he wants to sell any of these guitars but he doesn’t own them because of us. He doesn’t owe us anything and he doesn’t have to do something because we, the fans, feel a certain thing. But of course it’s a bit sad. Many of his guitars, and obviously the Black Strat in particular, has been the holy grail in my Gilmour fandom and in many ways the centre piece of this site. Just like pedals, guitars are tools you use to create or realise what you have in your mind. It’s the tools you use to create music and sounds. It’s simple as that. A guitar might have a sentimental value but it’s a tool. David talks about how much these guitars has given him. All the inspiration and emotion but it’s time to move on and create something new – funds for the causes he believes in. In that sense, these guitars creates again but in a different way than before. And keep in mind, this isn’t something new either. He did retire the Black Strat in 1983 when he gave it away to Hard Rock Café and bought brand new guitars from Fender, which has become almost equally iconic. By chance, the Black Strat turned up again in 2005 and the Live 8 reunion but it could equally well have just faded into history. Will it chance anything? He has made it clear that he’s not thinking about retiring yet, meaning that he doesn’t rule out a new album and, I guess, a new tour. When is obviously too early to tell but I don’t think you can expect someone who’s been making music and toured all their life just to retire because they’re getting older. It’s in their blood and in some form or another, David will continue to be active. He won’t be selling the ’55 Fender “Workmate” Esquire and, as he said, he’ll probably continue to use a Relic of the Black Strat. Now, this might sound insane to some but why not? Those guitars are so well built that even he can’t feel the difference. If he can still get the job done, continue to be inspired and, get to sell the original guitar for a good cause then why not? Again, an instrument is a tool for the artist. Artists move on and evolve. It’s the nature of the artist. See the Christie’s auction site for more details on what guitars David are selling. What’s your opinion about David selling these iconic guitars? Share your thoughts in the comments field below! Stick a piece of Wood with Strings in his hands voilà magic Tones comes out. Simple as that ,black Red,yellow white doesnt matter. Sell and give away and feel good about it must be smartest Movie,and the ord man i smart. Old man is smart !Jesus am i blind . Just been to Christie’s to see them. It is amazing, you can go right up to them with no glass. The temptation to not respectively touch them was difficult. Very emotional! I purchased ALL exact Parts/Body/Neck of DG’s Black Strat from Fender Custom Shop dealer couple of years ago. And had my buddy who happened to be a highly respected luthier in San Francisco Bay Area, put it together and set it up to Custom Shop specs. Over time as I played it few hours a day, it settled it and with few more adjustments to my specs, and now it plays like butter…! I have many other very fine guitars, but by far, this is my favorite electric guitar. If you folks have not tried 7.25 radius with vintage frets, you owe it to yourself to try it, it’s so smooth and easy to play! Just in case you don’t know, Christies are taking bookings by phone to see the collection. Due to it’s popularity they are restricting it to one hour slots. Please note they open from 12-5 on Saturday 30th March. Two nights ago, I dreamt that I had won some species of competition and the prize was to spend a day with David Gilmour. It was a superb dream and sadly, the closest I’ll ever get to meeting David Gilmour who is the person who comes closest to a hero for me. This is yet another reason why, in my opinion, David has a heart of gold. I love him. His language is music and he emotes in a manor fitting of a extraordinarily inspirational and saintly artist. I purchased my airfare to go see the collection in LA. I’ll be sure to totaled lots of pics. Maybe his sons from second marriage have no ambitions. But Matthew Gilmour, the son of his first marriage, has it very well. He’s already given away a house, selling a superfluous London abode and giving the proceeds to Shelter. He did that ages ago. I think it’s great that he’s selling a somewhat pointless guitar collection. Who needs 120 of the things? But I’m surprised about the Black Strat or even the red Strat. That is because they have iconic status and it’s one of the fun things to see him with on stage. But hey, if he wheels out a replica, who is going to notice? The sad thing is that these guitars will be acquired by some banker or someone with oodles of money and won’t be used to produce any music. Why would you? You can use any other guitar for that purpose. I am very surprised by the paltry values that Christies has given them. The famous ones at least will make multiples of the amount they suggest. The Black Strat? That must be worth nigh on half a million quid. I also find it amusing that people set such store in having the exact instruments that famous musicians use or used. The latter often just picked them up on a tour, or they were one of their first purchases. My own guitars are now iconic – of me! Ah, the amber Strat with Semour Duncans that no one is ever seen with apart from me. Or the black Tele with the Warmoth black pearl pickguard – so iconic, of me! Still, decluttering is a fab thing to do. Try and die with as little as possible, everyone will thank you for it and if you don’t, your stuff will mainly end up in a skip in any case. Sad! Obviously hard to understand in a way but one of my first thoughts turned to him giving away the strat as well. The only thing I find a bit ridiculous is the assertion that they will “go on to create for someone else.” As you said maybe in the money. But sadly I don’t think we’ll see anything coming from them besides maybe being in some exhibits when the wealthy new owners lease them. 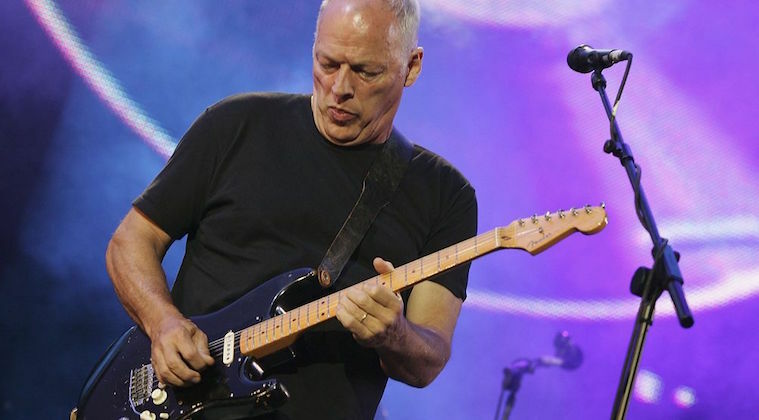 It is a great and noble thing for David Gilmour to sell his guitars to help humanity. And in that same spirit of philanthropy is only right for me to accept contributions so that I can acquire the black strat. Yes, I am willing to sacrifice my time collecting your go fund me payments to purchase that iconic guitar and will gladly make a video of me playing it for you all (with sound off). Thank you and please include a little extra for guitar lessons. This is hands down the best comment on this website that i have ever seen. EDIT: Also don’t forget to play the Black Strat regularly through a Kemper, using it to do covers of lullabies for children and mimicking Lil’ Wayne. And certainly don’t forget to boast about how you have acquired “Blackie”. My heart sheds a year, but my mind knows it’s absolutely the right thing to do. Other than a few of of the guitars hesh keeping, they were just tools to him. The Workmate, probably the 0001 Strat have a great deal of sentimental value I assume, and I haven’t seen a list of what he’s keeping, but there are likely several others that were gifts, or that were received under memorable circumstances will likely be kept, but guitars given to him by Fender, or ones he purchased have more value as a gift to the needy than they do sitting in his various studio, and practice spaces. So, a huge pat on the back to a great man, and now philanthropist, David Gilmour, the best in many ways. I remember reading a while back about Gilmours reaction and puzzlement when his guitar tech, Phil Taylor, suggested writing the book about the ‘Black Strat’, and also have read him recently joking that he may in a few years seek some of his guitar that get sold and buy them back, or even (in reference to ‘the’ Strat) that he may now start to play one in a different colour !!! I’m a fan of Gilmour, the musician and the man himself, and (once the initial panic had subsided) have a great deal of respect for his decision to auction his personal treasures, as said, putting people above things. I am also a fan of this site, and have used it over the years as a reference and guide in reviewing and purchasing equipment, not so much to emulate Gilmour, but trusting that if something is good enough for him (as he is notably a caring perfectionist when it comes to tone and sound), then it must be good … but end of day, Gilmours sound is in his fingers and soul. I also appreciate the experience and perpective in your reviews Bjørn, and of course your own magical skills in playing … even if it all ends up happily costing me a small fortune, with only myself to blame … nuff said !!! Well it is a bit sad. However, they are his guitars after all and he can do what he wants with them. And I dont think anyone needs 120 of them. If I were him, I would probally sell all electrics but the black strat, and the workmate because of sentimental reasons. That black strat has been through the war with him. If he is ok with playing the relic replicas, that’s perfectly ok. It seems from the interviews that he really believes in his cause. It is a very noble thing to do this, and very admirable. David is so humble, and seems to be one of the nicest guys ever. If I were British, i would be damn proud of this man as a representation of my country. He also seems like he doesnt want the black strat to be hanging in some museum collecting dust. He WANTS other guitarist to use, and create with them. If I had FU money, I would try to get the tele with the sunburst and rosewood neck he used on Dogs, for that is one of my favorite songs, favorite tone, and tour. If Bjorn Riis started a GoFundMe to try to acquire just one of these guitars, I would absolutely support it! Bjorn, you have given all of us to much of your time, attention, and try to answer all of our questions, it would be the least all of us in the Gilmourish community can do. Yes, I agree with this. I’d hand over a few quid for Bjørn to acquire the Black Strat! Start off your fund, Bjørn, you never know where it might lead! There wouldn’t be any point me having the Black Strat. i’d need the Hiwatt stack to go with it, and the building to house the Hiwatt stack! Eric Clapton did the same with his guitars, I do not accept it because his image is associated to the black and red strat but I understand that 120 guitars are too much, perhaps a lot of them were played only one time, and I understand they are only work tool for him too. I do not think he is going to retire, only he realized that he is becoming old and as I can remember his sons has got no interests to play guitar. Basically I respect his decision and want to say thanks to all of this instruments for the melodies and music they inspired him and, obviously, for the moment of relax and of dream his music gave to me. I hope he will continue to play. Anyone know where a full list of everything that he is putting up for auction can be found? David retired The Black Strat when I gave him the Red Strat (well a couple of years later) which started his relationship with Fender with a bang and a cracking six Dan Smith era Strats selected with David and Phil Taylor at CBS Fender in Enfield by John Hill who was introduced to David by Joe Brown. This introduction to Fender led to a longstanding relationship to this day and from stock selections to the Fender Iconic Series, which are known as the Signature series, and the custom shop copying of The Black Strat with the intention initially (as in the replication of Eric Clapton’s Blackie) to leave it at home safe from the rigours and risk of touring. Following The Eric Clapton Crossroads Sale releasing collosal emotional equity into huge capital beneficence for charity my Fender Custom Shop programme inadvertently began to release iconic guitars to benefit charitable causes because the replicas were actually better than the originals which could now do so much good for the world having made their place in the history of music and in Pink Floyd’s and Eric Clapton’s case having sold multiple millions of records and launched millions of guitar players dreams! And of course this replication of iconic guitars didn’t just make dreams come true for budding guitar players it made them available for blockbusting touring exhibitions like the V&A’s ‘Pink Floyd Their Mortal Remains’ the guitars in which were a huge attraction and a uniquely up close engagement holding an emotionally invested public spellbound. I think it’s fantastic that David has decided to this. At first i felt it was sad to see him let go of the black strat but then again, it’s a tool that can be replaced. The fact that he does this for charities of his choice speaks volumes about his values. Not many of his peers would do this at this point in their career. He probably couldn’t have found a better time than this. As I’m sure many of us do, I have mixed feelings about this. It’s for a great cause, no doubt, so on that level alone, it’s extremely admirable to see David so willing to give up the very tools that have helped him create such great, inspiring and timeless music, regardless of whether he’s decided to retire or not. Incidentally, I’m not one that thinks that this is in any way an indication of retirement. As Bjorn said, he put down the Black Strat once and made the Red Strat IMO equally as famous and sought after by his fans. As well, when you think about, other than the 2 Strats, David has never been married to any guitar for a long period of time. He’s kept them and eventually gone back to them, but he’s always been open to bringing in new axes. He started with a Tele, his Black Strat has been modded so many times it’s essentially been a different guitar many times, he’s gone through periods where he’s used the Workmate a lot then not at all, in favor of new Tele’s, same with his 2 Les Paul Goldtops. He recorded Breathe and Great Gig on a pedal steel but as far as I know, he’s never brought it on stage, in favor of his lap steels. And on Momentary he used a lot of a Steinberger, which we’ve never seen again…… There are many more examples but I think the point is made. He’s been willing to use a lot of guitars over the years, and maybe he just wants to take another shift in tools. I have to admit though, part of me is a bit disappointed that people who don’t have the financial means to bid on these guitars, won’t have the opportunity to adopt and experience any of them. Again, it’s for a great cause, so I do get it. But, just by the simple facts of life, there are probably many more of us who’ve been inspired by and love David and his music, that can’t afford to bid, than there are people who can afford to. I wish there was a way that all of us had equal opportunity to obtain 1 of these iconic instruments. I respect him a lot for doing this. As he said, those instruments gave him important things, and are part of his life in music. He really doesn’t need them, in terms of creativity and also money. But I think it took some time before he could see things this way. It certainly wasn’t easy at all, even for him. Well, it’s somewhat sad to me, probably because he’s not much older than I and it reminds me that our time is running out. I’m sure he’s asked family & friends if they would care to have any of them, maybe? I’ve been a fan from the mid 60’s & have seen him live several times, hopefully once more might be in the cards, who knows. I think it’s noble of him to do this, God Bless him for it, he’s a good man. In case anyone’s interested, there’s also an interview available over on BBC 6 music. In that, he states that the black Gretsch Duo Jet is another guitar he will not be selling. I mean, he could play just 300$ squier strat and still sound like gilmour which he is! Also I wonder how much he believes they will go onto anything to do with creating new music. At the prices they will go for that’s almost a laughable to think that at all. As a musician of course I would love playing his stuff but i much prefer the stuff i have built and changed and worked with over the years than to just go ahead and get his after all. So theres really no reason to think they will be played. For my own odd reasons I wish they were gilmour heirlooms. Having control on the destiny of your belongings before you pass away or get too old to remember what it is, that might be an explanation. Let’s not forget that the reason why we are all watching this site Gilmourish is because we are all fans of David and his guitar tone. As a consequence, he does not have the same relationship with a guitar than we do. I disagree with your Squire reference. I think many guitar players do not wish to believe that if you handed David a 100 dollar squier and he set it up how he saw fit that he would still be light years ahead of many of us. David’s guitar playing is what finally gave me the jump to move from classical violin to rock and blues guitar. This is because i recognized first and foremost his very classical sensibilities, and being a terror many private teachers (I would just get a recording and learn to play pieces that way) I recognize his natural ability with string instruments. he would have been a violin prodigy 50 or 100 years earlier if it entered his life when guitar did. what comes second is figuring out what the vehicles are, I was enamored with his clean stratocaster (single coil) tone, more so than any other guitar sound I had heard. It wasn’t until i got more into rock music that I even gave his fuzz and distortion sounds the time of day. What we should be coming here for is historical reference and a great benchmark to learn about how effects work from the viewpoint of someone who matured as an artist along with the circuits… they were concurrent. Now we have a giant chart of things to get, and at least for me, eventually you HAVE to ween yourself off of. I know many people who are disappointed after they acquire all the gear he did and realize they can’t do anything with it. Gilmour would most certainly blow a performance away with a 100 dollar squier, given that it stayed in tune for a whole song. I feel like you are going to run into some sadness at some point if you continue fooling yourself on this point. Totally agree about the Squier comment. You only have to look at Andertons videos blindfold to know that it’s hard to differentiate a Squier from a Fender Custom Shop guitar costing many multiples more. Gilmour would make anything sound good. respectfully disagree about the Squier comment. Reflecting on life it simply means he values people over “”things”. Impeccable self awareness and a way to give back and keep the music playing with his legendary tools. Selfless, enlightened approach to making decisions. I didn’t know I could respect Gilmour more than I had. He seems like a genuinely good person. I love what he’s doing. It’s an admirable act to let go of belongings especially musical instruments that you love for a social cause. He is now even a bigger hero for me. Also it is a message to musicians that if you know what you are doing and feel confident of a creative flow, it’s all in your head and your hands so he could pick almost any guitar and sound like David Gilmour. This is his wish, and in my opinion it gives him lots of honor, simply because he did everything that a man possibly coukd do with these tools as you called them. It gives him honor because he will raise millions with the auction, and since life gave him the incredible talent, and the fortune he acquired with that, he just feels like give back, yet I can’t stop thinking that most likely these tools will end up in the ends of some millionaire that will use them to brag about his achievements. David is the most fascinating musician of all time, in and out the stage, much respect for the man, and my God bless him with his future endeavour, remain assured that he could pick up a $100 guitar and make it sound like the black strat.